NOTE: If you select a keyframe in the Timeline view and press the Delete key, you will also delete the drawing exposure. To only delete the keyframe, you must use the Delete Keyframe command—see Adding and Deleting Keyframes. ‣ Right-click on the selection and select Insert Keyframe and Duplicate Drawing. In the Timeline view menu, select Motion > Delete Keyframes. 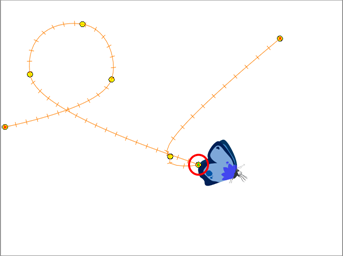 ‣ Use the Transform tool to select a keyframe to delete from the trajectory in the Camera view and press Delete.